A Qantas cargo plane lost cabin pressure, leaving a pilot incapacitated. THE Australian Transport Safety watchdog has launched an investigation after a Qantas-owned cargo plane lost cabin pressure left a pilot incapacitated. 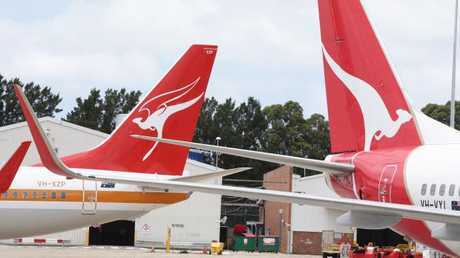 The Melbourne-bound Boeing 737 was on route from Queensland on Wednesday afternoon when the crew received a "wing body overheat warning" which resulted in the reduction of cabin pressure. The sudden drop in pressure forced crew to employ oxygen masks and the plane to descend to 20,000ft over Narrandera in southern NSW. The First Officer became incapacitated during the incident, forcing the Captain to descend further to 8000ft and make an emergency landing in Canberra shortly after midnight. Both pilots were taken to hospital as a precaution. No passengers were on board the freight service and there was no damage to the aircraft during the incident or landing. The VH-XMO cargo plane was part of the Express Freighters Australia fleet which is owned by Qantas and run out of Sydney. The ATSB will collect and examine information on the aircraft's flight data recorders and interview maintenance and flight crew as part of the investigation into the "serious incident". "Should a critical safety issue be identified during the course of the investigation, the ATSB will immediately notify those affected and seek safety action to address the issue," the ATSB statement read. A final report of the investigation is expected by the end of the year.